Essential equipment for improving grip and the strength and endurance of your back as simply as possible. The Singular WOD Farmer Walk Bars are essential equipment for improving grip and the strength and endurance of your back as simply as possible. It’s a system as old as carrying heavy things. 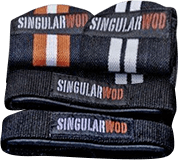 The Singular WOD Farmer’s Walk Bars allow you to improve your ability to carry heavy loads, using only the strength of your forearms and hands, from one place to another. Crafted with lacquered iron, the bars are 150 cm long, with a 30 cm sleeve, and each unit weighs 20 kg (40 kg for the pair). Exercising with the Singular WOD Farmer’s Walk Bars allows the improvement of the grip strength of forearms and wrists, using stabilizer muscles, and it directly helps dead lifts and weightlifting, as well as most fitness and strongman training.